In the Dolphin Encounter Program, you can expect a unique experience that brings you closer to an Atlantic Bottlenose dolphin than you ever dreamed possible! Not only will you see the bottlenose dolphin habitat, but you will learn important information about dolphins and the ocean. 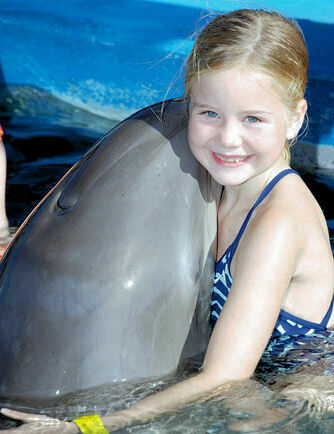 On the Dolphin Encounter float, you will stand on a waist-deep submerged platform and experience a heart-warming kiss, a hug, a dance and opportunities to rub down the dolphin. Your dolphin trainer will combine elements of hands-on contact, education, fun, laughter, and adventure to make this an unforgettable experience. You will be in the water with the dolphin for approximately fifteen minutes. While you enjoy your Dolphin Encounter and learn about the dolphin habitat you will also be in the midst of one of the finest natural attractions in the Bahamas. Our professional photo and video staff will be capturing your encounter so that you will have a chance to take home incredible souvenirs of your once-in-a lifetime experience. Please note guests age 3 or younger participate for free if accompanied in the program by a responsible, paying adult with a ticket for the encounter. Parent or guardian must be at least 18 years of age. Guests ages 4 to 12 may participate at full price & must be accompanied (in the water) by a responsible, paying adult with a ticket for the encounter. Lunch is available for purchase. Please note we will provide full assistance for manual wheelchairs including providing wheelchair access into the water (with our waterproof chair) for the Dolphin Encounter program. For boating purposes, motorized power chairs and non-collapsible wheelchairs are not allowed on our boats. Alcoholic beverages are not allowed on the property. Guests age 3 or younger participate for free if accompanied in the program by a responsible, paying adult with a ticket for the encounter. Parent or guardian must be at least 18 years of age. Guests ages 4 to 12 may participate at full price & must be accompanied (in the water) by a responsible, paying adult with a ticket for the encounter.Approximate cost of the taxi to the tour departure area is $5.00 per person and is about a ten to fifteen minute ride depending on the traffic. There are no pregnancy restrictions on this tour, pregnant women are welcome to participate if your doctor approves. This tour goes rain or shine! Lunch is available for purchase. The beach closes at 4:00pm.